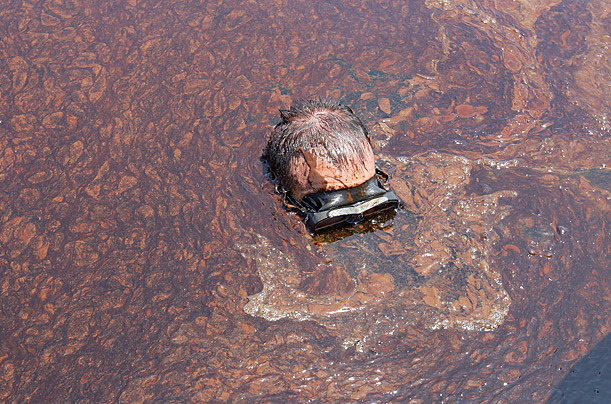 AP photographer Rich Matthews plunges into coverage of the Gulf oil spill. This takes coverage of the oil business from the era of Ida Tarbell to the era of I Dodge Tar Balls. A law enforcement official said the undercover officer who made the secret recordings was in his 20s and was a five-year police veteran of Egyptian descent. To those in the know, this much information is probably more than enough to identify this person. This much information could readily compromise this investigation or other investigations that this undercover officer is involved in. This information is of zero value to the average reader. There is no indication that this undercover officer has done something wrong or anything of the kind of misconduct that might possibly justify “outing” the agent. So, what was the point? Why did the anonymous “law enforcement official” pass that information along to the Times? Why did the reporter put it in the story? Why did several editors let it get out to the public?